HONG KONG, Apr 10, 2019 - (ACN Newswire) - Design Capital Limited ("Design Capital" or the "Company", together with its subsidiaries, collectively referred as the "Group") announced today the details of the proposed listing of its shares (the "Share Offer") on Main Board of The Stock Exchange of Hong Kong Limited ("HKEx"). 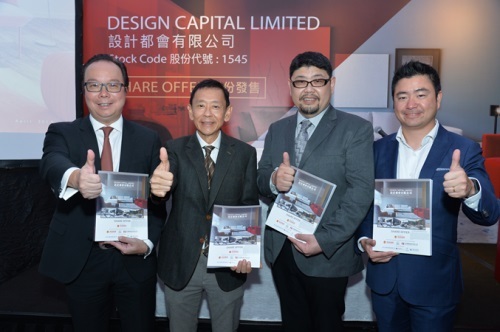 Design Capital plans to offer a total of 500,000,000 shares, subject to the over-allotment option, comprising 50,000,000 Public Offer Shares and 450,000,000 Placing Shares, at an Offer Price ranges between HK$0.30 and HK$0.39 per Offer Share. The Public Offer will open at 9:00 a.m. on Thursday, 11 April 2019 and close at 12:00 noon on Tuesday, 16 April 2019. The allotment results will be announced on Wednesday, 24 April 2019. Dealings in shares on HKEx are expected to commence on Thursday, 25 April 2019, under the stock code 1545. Southwest Securities (HK) Capital Limited is the Sole Sponsor. Southwest Securities (HK) Brokerage Limited, Ruibang Securities Limited and Central China International Capital Limited act as the Joint Global Coordinators and Joint Bookrunners. Southwest Securities (HK) Brokerage Limited, Ruibang Securities Limited, Central China International Capital Limited, Yuanta Securities (Hong Kong) Company Limited, Emperor Securities Limited, Chuenman Securities Limited and Aristo Securities Limited act as the Joint Lead Managers in relation to the Share Offer. Design Capital has entered into a cornerstone investment agreement (the "Cornerstone Investment Agreement") with 2E Capital Pte. Limited (the "Cornerstone Investor"), a private company incorporated in Singapore with limited liability in 2005 and has invested in residential and commercial properties. Pursuant to Cornerstone Investment Agreement, the Cornerstone Investor has agreed to subscribe for the Shares at the Offer Price in the amount of HK$23,000,000 (the "Cornerstone Placing"). The Shares under the Cornerstone Placing are subject to a restriction on disposal for a period of six months. Design Capital is a longstanding furniture seller on third party e-commerce platforms in the U.S., a mid-to-high end furniture retailer in Singapore and an integrated home design solutions provider mainly in Singapore. With extensive experience and established network in furniture retailing and sourcing for over 20 years, the Group currently supplies various furniture brands targeting different market segments through e-commerce sales platforms in the U.S. and through the seven points of sales in Singapore. Design Capital ranked 4th in terms of revenue for high-end furniture retailers in Singapore in 2017 . The Group's interior design projects have been highly recognised in the market and received several industry awards in the Asia Pacific region in 2012-2018. The Group principally operates three business segments including (i) furniture sales in the U.S.; (ii) furniture sales in Singapore targeting customers of mid-to-high income group; and (iii) provision of interior design services in Singapore, Malaysia and Brunei. Under the U.S. furniture sales segment, the Group sources products mainly from the PRC and Malaysia to be sold under its four brands - "Target Marketing Systems", "TMS", "Simple Living" and "Lifestorey". Information of sourced products are uploaded onto the websites of the Group's customers, allowing end-consumers to place orders. Under the Singapore furniture sales segment, the Group operates its points of furniture sales branded under "Marquis", "Lifestorey" and "OM" which cater to different customer groups. The Group sources furniture products internationally and offer customers in-stock items and made-to-order items. Under the interior design segment, the Group provides project-based interior design, fitting-out and design consultancy services for showflats of residential property development projects and individual residential units in Singapore, Malaysia and Brunei. During the Track Record Period, the Group's revenue increased by approximately 11.5% from S$90.5 million for the year ended 31 December 2016 to S$100.9 million for the year ended 31 December 2017; and further increased by approximately 8.7% to S$109.7 million for the year ended 31 December 2018.The rapid growth of the U.S. furniture sales business has resulted in the steady increase of the total revenue during the Track Record Period. The Group's profit for the year increased by approximately 41.7% from S$6.0 million for the year ended 31 December 2016 to S$8.5 million for the year ended 31 December 2017 mainly attributable to the increase in the revenue and the decrease in the expenses. The Group's profit for the year ended 31 December 2018 was approximately S$9.8 million. Started the furniture sales business in the U.S. in 2005, the directors of Design Capital believe that the Company now has an extensive sales network with long established and stable relationships with international e-commerce sales platforms in the U.S; well-positioned to capture the opportunities arising from the rapid growth trend in the furniture online sales and has developed a solid brand recognition with a well-defined brand portfolio strategy and effective marketing campaigns for each of its business segments. The Group adopts a broad brand portfolio strategy to differentiate its products to better cater to the spending power and preferences of customers in different market segments. Meanwhile, to reinforce the industry recognition, the Group invests in marketing campaigns through various types of media to promote and increase its brand awareness. The Group is also highly recognised for its interior design projects and had received a number of industry awards. With the extensive experience in home furnishings, in-depth understanding of the homeowners' preferences gained through different interior design projects and the designer team's acute sense of aesthetics developed, the Group is committed to delivering design solutions and home furnishing ideas for homeowners at various market segments. Besides, Design Capital has established long and stable relationships with its suppliers and subcontractors. The directors of Design Capital believe that with the diverse and stable supplier base, the Group has the ability to source for diverse products and adjust its product portfolio in an efficient and timely manner to meet changing market demands. The Group also has an experienced management team with comprehensive operational and industry knowledge and a strong design and quality control team. Mr. Goon Eu Jin Terence, Executive Director, Chairman and Chief Executive Officer of Design Capital says, "We are pleased to witness this significant milestone in the Group's history. Through our listing on the Main Board of HKEx, we will tap into the international capital markets. This will not only broaden our capital and shareholder base, but also provide us with capital to fund our expansion plan, which will finally strengthen our position in the industry and further enhance our competitive advantages, thereby driving the Group's long-term development." "Given that there is a robust growth in the U.S. e-commerce market and our Group's market presence and recognition in Singapore is considered strong enough to further advance the synergies for our business expansion and increase market share at the moment, we believe it is the optimal time to implement our expansion plan to seize the current market opportunities. In light of this, we aim to expand our business by further broadening our sales and marketing network; expanding our product mix and brand portfolio; strengthening our brand recognition; and continuing to retain and recruit talents to support the Group's future growth, so as to maintain and strengthen our market position." Mr. Goon Eu Jin Terence (Left 2), Executive Director, Chairman and Chief Executive Officer and Mr. How Ti Beng, Ben (Right 2), Strategy and Business Development Director of Design Capital Limited, together with Mr. Ernest Tse (Left 1), Managing Director and Co-Head of Global Capital Markets of Southwest Securities (HK) Capital Limited, as well as Mr. George Mang (Right 1), Managing Director of Central China International Capital Limited announced the details of the Share Offer.